MINNEAPOLIS — The final afternoon of the regular season for the Minnesota Twins was filled with cheers, chills and even a few tears as a lively crowd at Target Field was treated to a meaningful and memorable game. Too bad for the Twins and their fans the playoffs weren’t at stake. They had to settle for a Joe Mauer tribute, the probable end to a 15-year major league career for the smooth-swinging, six-time All-Star and one of the best athletes the state has ever produced. The first big news of what will be a busy fall and winter in Minnesota will likely be the announcement from Mauer about whether he will continue his career at age 35. The sentimental scene on Sunday as the Twins beat Chicago to finish with a season-best sixth straight win left little doubt he’s done. “Either way, it’s a good decision, you know? 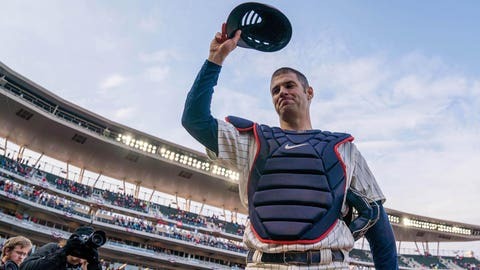 I can either play, or go home and be with my girls,” Mauer said before hitting a double and donning the catcher’s gear one last time for a ninth-inning curtain call. The end of this year was already going to be pivotal for the Twins. Not only does Mauer’s $184 million contract expire, but a bunch of other important players are also coming off the books. Several of them, with Brian Dozier and Eduardo Escobar leading the list, were traded away this summer once the front office concluded the 2018 roster was not strong enough to contend. After owner Jim Pohlad approved a club-record opening day payroll of more than $130 million, the Twins have less than $25 million committed for 2019 salaries to catcher Jason Castro, relief pitcher Addison Reed and starting pitcher Michael Pineda. Starting pitcher Ervin Santana ($14 million) and designated hitter Logan Morrison ($8 million) can each be bought out for $1 million each and, considering their injuries this season, almost certainly will be. That leaves a large portion of the roster unsettled for next year, but it also creates extra flexibility for chief baseball officer Derek Falvey and general manager Thad Levine for their third season in charge. The 78-84 finish after their appearance in the American League wild card game the year before was disappointing, but the timing of the downturn could prove to be convenient. Fernando Rodney proved to be a valuable addition at age 41 with 25 saves and a 3.09 ERA, faring far better than the other acquisitions — Morrison, Reed and starting pitchers Lance Lynn and Jake Odorizzi. Rodney wasn’t spared in the roster purge, leaving the Twins without a closer. Trevor Hildenberger was handed most of the opportunities, but he stumbled badly down the stretch with a 9.00 ERA and seven home runs allowed in 27 innings after the All-Star break. Jose Berrios and Kyle Gibson give the Twins two established starting pitchers for 2019, with the 24-year-old Berrios carrying clear potential for further growth into one of the game’s best. Odorizzi will probably get another opportunity, with the durability of 32 starts he made this season his best debut contribution. There’s plenty of space for a newcomer in free agency or by trade, with Kohl Stewart, Stephen Gonsalves, Fernando Romero, Zack Littell and Chase DeJong among the prospects under consideration for the rotation when spring training starts. “The jury’s out on in terms of who of these guys are going to emerge,” Molitor said. The knee injury that ended Castro’s season early gave Mitch Garver an extended audition as the regular catcher, and he made significant strides both with the bat and behind the plate. Byron Buxton’s injuries, inconsistency and eventual banishment to Triple-A created an unexpected role for rookie Jake Cave, whose on-base-plus-slugging percentage (.797) trailed only Escobar and Eddie Rosario among regulars. One bright spot in the bullpen after Rodney, Zach Duke and Ryan Pressly were dealt away was left-hander Taylor Rogers, who finished the season with a 26-inning scoreless streak that was the longest active run in MLB and the fifth-best in Twins history. Rogers had a 2.63 ERA and just 65 hits and walks allowed in 68 1/3 innings. Rogers, along with righty Trevor May, who came back strong after Tommy John elbow surgery, gives the Twins a foundation for the back of the 2019 bullpen.